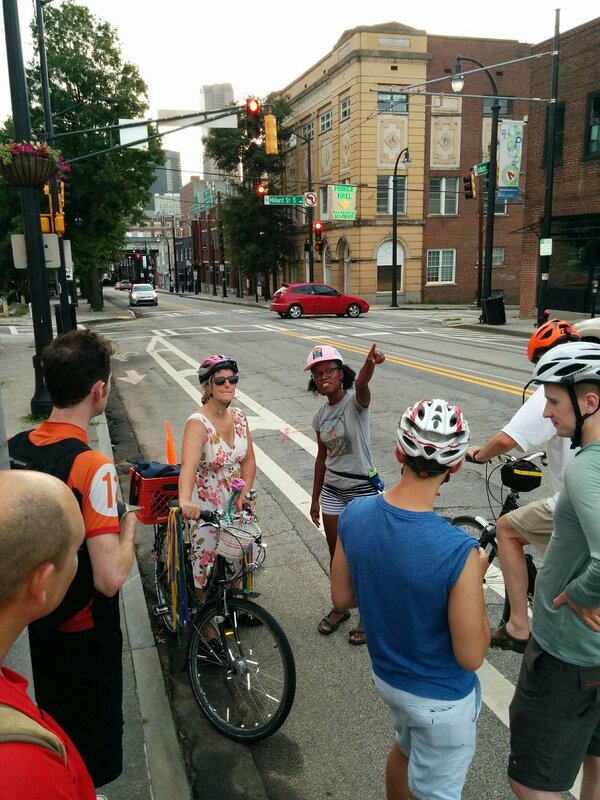 On Saturday, April 27, Civil Bikes and The Georgia Conservancy’s Sustainable Growth Program are partnering to host a 3-hour bike tour through Atlanta, visiting key neighborhoods and historic sites, such as Sweet Auburn, South Downtown, Vine City, West End, and Summerhill. Along the way, we’ll tell the untold stories of Atlanta’s history and examine the influences that have shaped the city’s current design, including redlining, urban renewal, and gentrification. Using the Georgia Conservancy’s “10 Lessons for Designing Cities” as foundation to understand the built environment, we will explore principles of Good Urbanism through the lens of spatial and social justice, and discuss how we can better shape an Atlanta that is more just and sustainable for all. This tour is for those who are both new to Atlanta and those who have lived here all their lives. Join us for discussion and sightseeing! Meeting Place: Martin Luther King Jr Recreation Center And Aquatic Center, Back Parking Lot // 110 Hilliard St. SE, Atlanta, GA 30312. Please consider using MARTA or biking to the event, if possible. Where: The bike tour is approximately 3 hours with multiple stops and a lunch break. The tour begins and ends at the King Aquatic and Recreation Center, with stops at Hurt Park, Underground Atlanta, Mercedes-Benz Stadium at the former site of Friendship Baptist Church, Rodney Cook Sr. Park, West End Mall, and the Summerhill Redevelopment on Georgia Avenue. Please bring a helmet, government-issued ID, water bottle, and anything that you need to be comfortable for the ride, including additional foods and/or drinks, sunglasses, sunscreen, clothing that is specific to the weather. Dress in a comfortable manner; athletic wear is not required. Civil Bikes will provide water and a simple snack at the start. The tour has a stop at a local business for lunch, but you can also feel free to pack your own. Cost: $65 and includes a bike rental from Civil Bikes. *All proceeds go to support the work of the Georgia Conservancy and Civil Bikes. Tour will include morning coffee from Cafe Campesino. If registration is full for the bike tour, please feel free to contact Brian Foster at BFoster@georgiaconservancy.org and we will put you on our event waitlist in case there are any cancellations. If we run into severe or inclement weather on April 27th, the bike tour will be rescheduled for May 11th. You will have the option of either joining on May 11th or releasing your reservation and receiving a refund for your tour. Did you know? Georgia Conservancy members have the opportunity to register early for select Stewardship Trips, as well as receive a discount on a number of our adventures during the year. Become a Georgia Conservancy member today, or renew your membership. “Our Aim is to Make Everyone Visible. Civil Bikes walking tours and bicycle tours of Atlanta brings attention to unseen and unheard stories about Atlanta in a unique and accessible way that creatively builds a just community and inspires action. The Georgia Conservancy's Stewardship Trips program is excited to offer our Day Trips for the fourth year in a row. Our Day Trips help to supplement and enhance our already robust statewide trips schedule and aims to highlight and acknowledge the diverse array of green spaces, natural resources, individuals and organizations that are putting metro Atlanta on the map for environmental stewardship and sustainable growth. Our Sustainable Growth Program works to foster smart, resilient development across the state, enabling communities to grow while using fewer resources and disturbing less open space. Programmatic focus includes: Blueprints for Successful Communities, Good Urbanism, School Location Choice, Small Town & Rural Resiliency, and Housing Flexibility & Attainability.